It always amazes me how life can just turn on a dime. You’re floating along in your little dingy and all is well and good. Then you hit a snag and the next thing you know your floundering in the current heading over a waterfall with no one there to catch you. 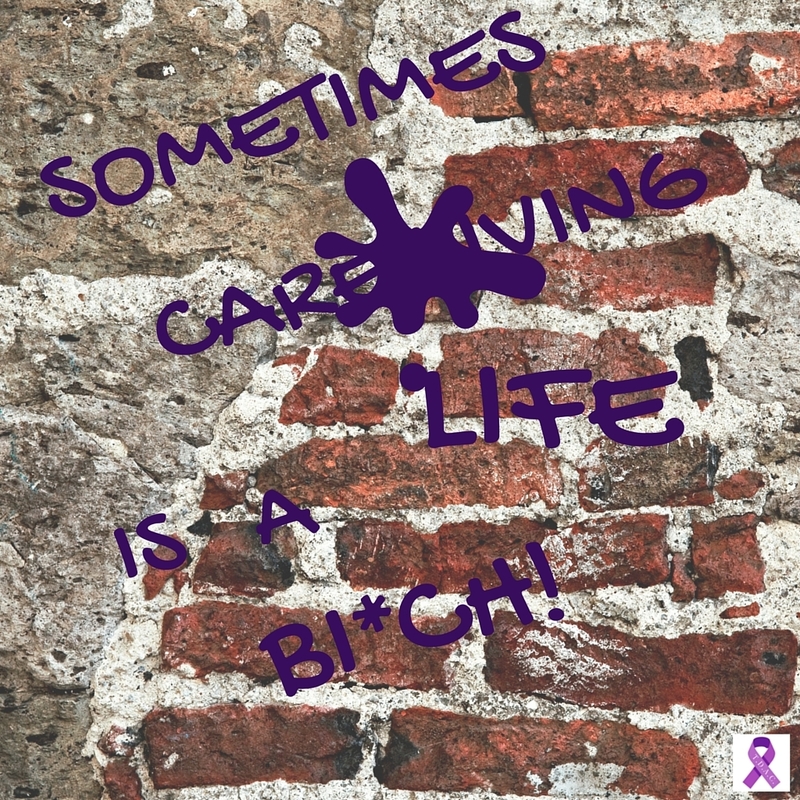 The worst part of being momma’s caregiver is the loss that I feel. It’s never more acute than when I have a lot of stress factors going on and I start to feel like an orphan on my own in the big city. Like I no longer have a safety net. That’s how I’m feeling now. Kind of shaky, sick to my stomach, and on the verge of tears, but trying to remain strong because I have to be. I’m in charge. Sometimes that’s a heavy load to carry…so why do I seek it out so often. That’s a post for another day. This is real live stress the kind that makes you want to curl up in the fetal position and just turn out the lights. Except that, I can’t sleep either. It all started the Sunday before last, well actually two months before with me going to the doctor because of extreme stomach pains. I had all kinds of tests done including 3 ultrasounds. The first thing they found was my gallstone, you might have met “Rocky” on Facebook a while back. Sorry, I have the sense of humor of a prepubescent boy. Then a week after I had my gallbladder removed they called to say that they saw a mass and that I needed another followup ultrasound. Okay…. (this is where I start begging to God, the same one I’m not sure I believe in). The problem is they can’t get me in for the ultrasound for 3 weeks, that’s 21 days, 504 hours, 30. 240 minutes…you get the picture. Those of you that have fought that fight, I commend you, Those of you that love someone who has gone through it, I’m sorry. It took another week to get the results: Fibroids of the uterus and right ovary. Recommendation: Hysterectomy. I can deal with that. Take it out. Take it all out as far as I’m concerned. That’s a less likely chance to sneak up on me at a later date. So, as I am mentally preparing myself for the second surgery in less than two months I feel a sense of relief that everything is coming out. I feel as if I am about to get an exorcism. That my uterus was the cause of all of the evil in the world. I had my first surgery to remove cysts on my ovaries when I was 15 and I’ve had nothing but pain all of these years. I had kind of started to see it as a fresh start of sorts. How crazy is that? I would go into the hospital and get the surgery and since I would be there for a few days it would be a perfect opportunity to quit smoking AGAIN (sorry Lana) and get on the road to looking and feeling better. I was excited to get a hysterectomy. I know, right! LANDLORD: HEY, RENA HOW’S IT GOING? LISTEN, DO YOU HAVE A MINUTE TO TALK? LANDLORD; I’M IN A BIND AND I NEED TO PUT THE HOUSE UP FOR SALE. I HATE SO MUCH TO DO IT, BUT I HAVE NO OTHER CHOICE. LANDLORD: ARE YOU THERE? HELLO…I REALLY WISH YOU TWO WOULD GO AHEAD AND BUY IT. YOU KNOW YOU WANT IT. LANDLORD: I’LL GIVE THE REALTOR YOUR NUMBER SHE’LL BE IN TOUCH. DON’T WORRY THOUGH YOU’LL HAVE AT LEAST 3 or 4 MONTHS BEFORE YOU HAVE TO MOVE. THAT STUFF TAKES FOREVER. That’s when the sleeplessness started. We love this house. We’ve been here for four years and we’ve loved every minute of it. All of our other conversations had led us to believe that this would be long term. That’s life though and as much as we hate it we have to move. We had plenty of time I wasn’t worried. I’d have the surgery and then we’d figure things out. That was Sunday the realtor called at 9 am the next morning wanting to come out two hours later and take pictures. I said okay wishing she would just leave us alone, Still, there wasn’t a sense of urgency. They showed the house on Wednesday and Saturday and we’re supposed to show it Sunday, but no one ever showed up. By this time momma doesn’t know up from down. She’s not sure if she has a home, if someone is taking our home, and it’s a horrible thing to watch. Every time someone would come she would ask them why they were there. I’ve kept most of it from her, but she sees the big red and white sign in front of the house. She’s been calling everyone and telling them she’s moving back to her old apartment in Kentucky where in her mind, her life was perfect. Every day she goes into her “little room” the smallest bedroom where she keeps a twin bed and all of her dolls lined up. She has furry pillows. It used to be her sewing room and these days it resembles the room of a child. I can tell she feels comforted in there so I leave her be. Now, she keeps packing things up, but not things that you would necessarily pack. For instance, I had to search her room, her purse, the car, the whole freaking house for her glasses. I found them at the very bottom of a box packed up with old clothes inside of an old jewelry box. Her ‘can’t see two feet in front of her’ glasses. Monday morning I get a text message from the realtor, mind you. The house is now under contract and the closing is on Jul. 29th and you’ll have to be out by then. So let me wrap it up for you and put a big fat bow on it! We have to move from a home that we love. I have to uproot momma once again right when I felt like I had a handle on it at least for today. I can only imagine what it’s going to be like when we do move. I feel like we need to do it fast. Li rke, ripping a bandaid off. What if I really screw her up somehow. I kill plants. I shouldn’t be trusted. I have no idea where we’re going to end up. I have to find a house and all that it entails which, I’m sure you all know, is a hell of its own.Dealing with people, phone calls, it’s enough to make me vomit and I’ m sure I will before its all over. I’m not familiar with this place as far as neighborhoods and East ends & West ends, who knows. Then we have to pack all of this and I mean ALL OF THIS STUFF . Husband and I are relatively simple. We lead a minimalist lifestyle except for some heavy furniture. I could be packed in a day. Then there’s momma. Four massive dressers and three closets that she has chocked full of not clothes, but anything else under the sun. Pictures, vases, necklaces, you name it there will be 10 of them. My husband’s back whimpers everytime he looks at it. She has this thing. She folds paper towels. She tears them off to hide her pop tart in and then she folds them into squares and hides it in her nightstand or her chest, anywhere. It costs me a fortune and drives my husband bananas. I say let her do what she wants. I can’t deny her anything even if I should. When you pack it up, you have to unpack it and move it and that’s no fun either and I still don’t know where that will be. I have an appointment Tuesday to schedule the hysterectomy. After that surgery, I can’t lift anything over a gallon of milk and that’s weeks after the surgery. Which means I”m going to have to live with this stomach pain for at least another month. AND THAT BIG BOW I WAS TALKING ABOUT…We have to move. Which means movers, Uhauls, money…lots and lots of money. Which means for the SECOND time. I have to cancel our trip to California and that my friends is a kick in the gut. I promised momma this trip. She has been waiting, we’ve all been waiting and now it’s just gone in the blink of an eye. I can always say next year, but what if there isn’t a next year and I never get to show her the Grand Canyon or the Golden Gate Bridge. That would have to go down as the biggest regret in my life. We’ll make it. I’m a positive person by nature and I have to believe that together, step by step, one foot at a time we’ll get where we’re supposed to be. We played it safe our whole lives and lost it all once before and survived that. I know that we can survive this. Life could be a whole lot worse. It’s just that when you live in a house where you must keep a perpetual smile on your face and chant Kumbaya you have to let it all out even if it does come fryouroru fingertips. I feel better already. Thanks for listening. OMGosh! Everything at once. I dealt with the hysterectomy years ago, and the gall bladder. This month we moved CoCo to her own apartment. We’re still cleaning up the rubble left behind. Little bits of things that are important for unknown reasons. She came over and saw a bit of neatness and freaked out. Still, that’s one thing at a time. All at once? No! I can’t even imagining. The title of your post doesn’t even begin to say it. Thank you Adela! It seems like a lot and I have to admit it’s been very stressful, but all we can do is take it one day at a time. Thank you for commenting. Oh Rena. No wonder you aren’t sleeping. On top of everything else, now this? Unreal. Thank you Helene. It’s been very stressful that’s for sure. It helps to be able to get it all out. So sorry to to read that so many nightmares are going on at once. With all that to deal with, it really does look like time to duck under the covers for awhile and disappear. I hope you find a new place soon and that you settle in quickly. Thank you so much Rowena! I hope you are doing well! Yow! Talk about a deluge! I always say that God won’t give us more than we can handle. But sometimes, I wish He didn’t trust me so much! Thinking of you, my friend. You will survive this, then have stories to tell in the aftermath! So true Diane, I don’t know how much more I can take! I’m sorry, Rena. I wish everything was going better for you, seems so much is hitting all at once. I’m only a PM away if you need to vent. Wish I could do more but that’s all I’ve got. I know you are! You are such an amazing friend Karen! Oh no Rena, this is a nightmare! To cope with just the surgery is enough and then to be thrown out of your home too. I wishing you bon courage from Switzerland to give you extra strength for the trials ahead. BTW absolutely love your new look. Thank you, Pat! You are so sweet! Horrible all at once! I feel for you. Oh Rena my friend I am so sorry. I wish there was something that I could do. Your neighbor sounds like the nicest person on earth. Thank you Pia and next to you he is! So sorry for all the stuff going on at once. You’ll survive. It won’t be fun, but you will So sorry. Laurie Stone recently posted…What Makes an Awesome Dad? Thank you Laurie! I appreciate your comments. Thank you Terri. I really appreciate all of the support I have gotten. I have the strongest feeling you’re going to find a perfect home really soon. I hope so Alexandra! I have to admit this is the most I’ve been stressed in a long time! Rena bless your heart! I bet moving is the worst part (would be for me!!) Honestly you have a damned good attitude. Praying for you…because that’s the ONLY way I survived my caregiving ordeal. OMG…mom and the pop tart and hiding them in paper towels….MY DAD DID THAT!!! I began finding them after he went into the facility and I was able to catch my breath. Um…bugs!!!! Took a year of pest control. I mean…half eaten McDonald’s cheeseburgers throughout the home. He had a guy who took him around on Mondays and i got to breathe for a few hours. We lived in the house a year together before he went into the first facility so figure 52 half-eaten cheeseburgers wrapped in paper towels. He had them behind drawers in the kitchen and everything. And your mom thinking she’s going back to her apartment…bless her heart. Go Rena!! You WILL be fine I can tell you’re a survivor. Thank you so much David for your kind words! It was hard but we’re here not settled and happy! That’s hilarious about the cheeseburgers! That would probably be me! I love a good cheeseburger! First time in your blog and was moved by your struggles, going through them, surviving with your positive spirit, taking one step at a time and yet finding time to share your story with us. It is the end of the story that we always look forward to and you gave us all a hope with an extremely positive message, love you! Thank you so much for your kind words! I really appreciate that.